obscene chewing: chick-fil-a part 1. Owing perhaps to their awkward bearings and their legendary stupidity, chickens are hardly likely to inspire the same anthropomorphic sentimentalism that, say, a cow, pig, duck, or even a mink would. I read somewhere that we humans tend to empathize with animals to the extent that they remind us of ourselves—which isn't to say that otters are beloved zoo denizens because they look like us (though they are nearer to us than crocodiles or centipedes, of course), but because we see in their playfulness and 'enthusiasm' something that makes us think of children: guileless, innocent, and joyful in the purest way that maybe only a child at play can be. Other animals—for instance, snakes or scorpions or spiders—might be alien and, therefore, frightening to us instinctively. Maybe this is a primitive hardwired response to be leery of certain small animals that could, in some cases, prove very dangerous for a human race that did yet not have a collective scientific understanding of these dangers to consult. 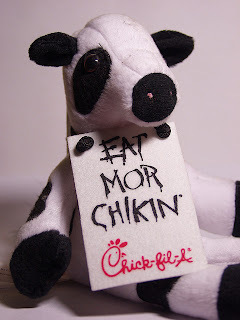 The recent Chick-fil-A anti-gay-marriage stance got me thinking about a lot of things—and one of them was chickens. One of Chick-fil-A's (only?) 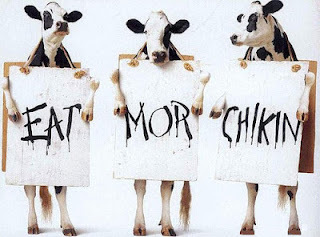 memorable ad campaigns involved cows wearing sandwich boards which exhorted diners to 'eat mor chikin' [sic]' in an unsophisticated bovine-like script (with an anthropomorphized spelling equal to that of the LOLcats). Although the deeper implications of the campaign were no doubt glossed over by most people who saw it, it generally worked on the assumption, I think, that cows are more endearing than chickens are. (Notice also that the sandwich boards are not thrown over the backs of cows on all-fours; the cows are standing erect, as if the concept itself weren't persuasive enough and the correlation had to be underscored.) This is a double-edged sword of course—because one of the stereotypes about chickens is that they are filthy animals who live much of their idiotic lives claw-deep in their own feces. And this stereotype must almost always be true, given the state of modern poultry farming. If the chicken doesn't have an instinctual love of filth, the poultry farming companies don't give them much of a choice anyway. This is their fate, ironically, in order that more chickens with more genetically desirable traits may be produced more efficiently for you, the consumer, to eat at restaurants like Chick-fil-A. The very things that are unappealing about chickens are reinforced by the food industry. It's generally not advisable for food producers and restaurants to remind consumers of the animals they are eating in their advertising. There are exceptions, of course (Charlie the Tuna comes to mind), but as a rule of thumb it is probably more advantageous for the food industry to divorce its products from any recollection of its living animal origins. The food biz thrives on the maintenance of this pointed disconnect between the grisly reality of animal farming and the food that ends up on our plates. Many people who are almost entirely unsympathetic to animal rights would not want to see the slaughter and butchering of the cow that resulted in their hamburger. At the very least, it's unpleasant. Fortunately, as in the case of many facets of our everyday life, we have designated intermediaries who do the dirty work so we don't even have to acknowledge the implications, much less think about them deeply. We don't have to see the sweat shops where our clothes are made, the third world mines where our jewelry is unearthed, or the death throes of the cow that doesn't quite die after the first air gun strike to the head. If life is not neat, tidy, and simple, then it's neater, tidier, and simpler than it has any right to be. This isn't an out-and-out condemnation of the estrangement between our comfortable lives and that suffering that often enables it—because that would be hypocrisy. No one who lives in an advanced country like the United States can possibly live a blameless life. The system is too widespread and deeply-entrenched to allow any of us a totally clear conscience. It's a system so efficacious that we only occasionally recognize it as a system; most of the time we don't even see it. And we like it that way. This is not a judgment necessarily; it's a description of what it means to be human: We must endlessly negotiate the give-and-take between our greater ethical responsibilities and our inherent desire to be happy or personally satisfied. If I were to devote every waking minute to seeking out the far-reaching implications of every decision I make, I would be, firstly, something less than a real person and, secondly, probably very, very insane. This is where we find the origins of liberal guilt. Like original sin, there's always the nagging sense among those (theoretically) committed to a socially responsible life that more culpability can be easily found under more overturned rocks. Eventually, we get exhausted and just quit turning over so many rocks—but we feel the weight of those countless and nameless sins of omission which result from the realization that I cannot be everything for them and still be something for myself. It may sound like a cop-out, or a bourgeois rationalization, but it's no more controversial than realizing we just can't do everything—but we must still deal with the question of what is enough. And this question is endlessly unanswerable. It seems the secular world has made real the idea of "original sin" which the ancient world could only philosophize about. I read this twice. I love it. That is all. It made me cry a little bit, but that is normal these days. I just feel so guilty about all the cheese and eggs.